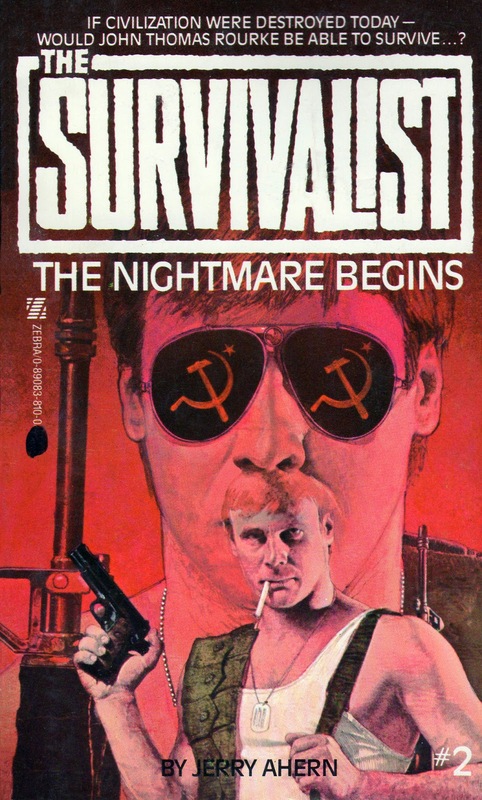 Jerry Ahern’s post-apocalyptic series 'The Survivalist' showed promise in its debut novel, “TOTAL WAR”. Early on in the book, nuclear war breaks out between the Soviet Union and the United States. I won’t give away which side wins; let’s just say we finish in the top two. Our hero is John Rourke, a trained physician and former CIA agent. A massive nuclear explosion hits while he’s traveling across the country on a commercial flight, and the glare of the blast blinds both of the pilots. Rourke steps up and manages to land the plane by himself somewhere in the New Mexico desert, and the rest of the book is all about protecting the passengers, scavenging the area for guns, and finally heading east in hopes of finding his family back home in Georgia. Near the start of that journey, he and a friend are confronted by a huge motorcycle gang, and in a memorable if unlikely finale, our heroes blow away every last biker. The second book, “THE NIGHTMARE BEGINS”, is similarly packed with adventure. Rourke has reached Texas, and will have to deal with radiation poisoning, armed paramilitary squads, an even bigger contingent of heavily-armed outlaws, and other perils. Meanwhile, his wife and small children are facing some of the same problems back home, and if anything the drama is even more effective on that front. The book ends on a strong and surprisingly poignant note, setting us up for more adventure in the next volume. Both books are good. But they’re not great, and they really ought to be. All the ingredients are there for some solid, breathless action/adventure fiction. Somehow, though, the books are interesting without being exciting, and the hero is very capable but he’s lacking in star power. Maybe it’s just me. Maybe it’s something about the author’s style that kept me at arms’ length from the material, I don’t know. I felt the same way about “THE BATTLE BEGINS”, the first book in Ahern’s 'The Defender' series, another post-apocalypse epic whose hero might as well be John Rourke’s twin brother. In both series, the material was just fine but the kettle never really came to a boil. Maybe I’ve been spoiled by other post-apoc series which were written later on, things like 'The Last Ranger' and 'Phoenix', in which there are mutants and cannibals running around and things are much crazier than what we get from Ahern. Don’t get me wrong. Overall, these Survivalist books are better than average, and I’ll certainly continue on to the next installment. I have a feeling things will get more... well, nightmarish. “THE NIGHTMARE BEGINS” is worth your time, and very likely you’ll dig it more than I did, especially if you’re a gun enthusiast and you enjoy reading about the specs of various firearms. Take your reading pleasure to the next level by playing the Survivalist Drinking Game: every time you see the brand name Detonics, take another drink. By the time the book is over, you’ll be so woozy you won’t know whether you’d read it or dreamed it.